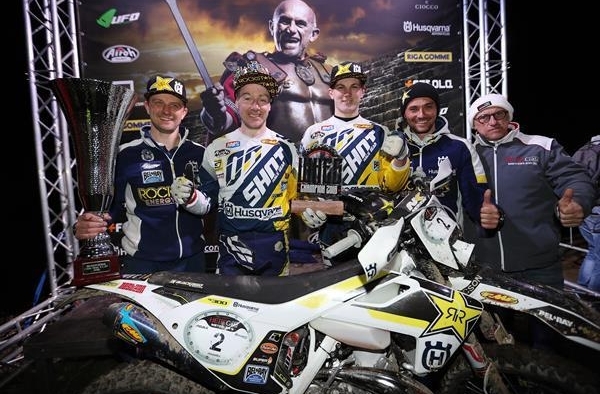 Rockstar Energy Husqvarna Factory Racing’s Graham Jarvis has cemented his place in the Hell’s Gate record books by claiming a fifth event win. Earning a hard-fought victory at the 2017 edition of the one-day Tuscan race, the recent Ales Trem winner finished more than four minutes ahead of his closest challenger at the end of the three-hour main race. Graham’s team-mate Billy Bolt ran as high as fifth in the main event, finishing the race despite an issue with his rear brake. Putting his name at the top of the results at the end of the morning’s qualifying race Jarvis showed that he meant business in Italy. Quick off the start in the main event Graham’s time out front was short lived as Wade Young set the early pace. Never far from his South African rival, when Wade suffered a small technical issue Graham hit the front and never looked back. Leading at the two-hour mark from Travis Teasdale, Graham steadily extended his lead as darkness fell. Maintaining his impressive pace during the final hour of the race Jarvis earned a well-deserved fifth Hell’s Gate victory, topping the podium ahead of Teasdale and Young. Billy Bolt’s first ever Hell’s Gate outing was a largely positive one. Fifth in the morning’s qualifying race he found himself stuck behind a number of riders on the opening climb in the main race, just meters from the start. Battling his way to fifth at the end of the first hour of racing, soon after his refuelling stop he damaged his rear brake. Hampering his progress during the second half of the race Billy nevertheless reached the finish.